While waiting for a train to take me back to Brooklyn from the Upper West Side on Thursday afternoon, I scrolled through the latest news and came upon word of a security threat to the New York City subway. The concern had its origins in brief remarks Iraqi Prime Minister Haider al-Abadi made at the U.N. He noted “accurate reports” from Baghdad that Islamic State terrorists were going to plan attacks against the New York and Paris subways. New York officials know the subway remains an open target, and having seen international systems suffer attacks, they sprang to action. By the end of the day, four New York higher-ups had determined that, in the words of NYPD Commissioner Bill Bratton, “no credible threat” existed to the subways, and everyone is itching to get more information out of al-Abadi. Still, security will be beefed up through the city over the next few days, weeks and months. To assuage concerns, Governor Andrew Cuomo and MTA Chairman Tom Prendergast hopped an E train from World Trade Center up to Penn Station and spoke of recent security improvements. The governor had previously announced a new set of anti-terrorism initiatives with New Jersey. For the MTA, this will, for better or worse, include an increase in uniformed police officer sat high volume stations by 30-50 percent, more random bag checks, additional perimeter and curbside sweeps and video of high profile locations. “Our administration has been coordinating at a high level with local, state and federal partners. I want to assure the people of New York that we are monitoring these reports closely and are in close communication with officials in Washington,” Cuomo said. The safety of the New York City subway has always been one of those things no one likes to ponder. We’ve seen images from Moscow and London and Madrid and countless other cities, but we’ve relied on the fact that anti-terrorism officials have stopped attacks in the planning stages (or before). For now, it seems there is in fact no credible threat, and New Yorkers can keep riding the subways as they do everyday. OMG !! Is that an actual picture of Cuomo on the subway? Isn’t that supposed to be one of the signs of the apocalypse ?? Who told Cuomo we have a subway? Did he ask where the ramp was to get his limo “down there” ?? That picture is obviously photoshopped. Or maybe it was shot on a backlot or in a studio somewhere. Love those pics of Cuomo and Prendergast. Cuomo looks like he’s pissed and trying to ignore Tom. Tom seems oblivious to that and keeps rattling on. It’s very deliberate P.R.. It’s designed to make Cuomo look authoritative. Back during the bad old days of the Bush regime, we were told that terror threats were used to boost incumbent politicians’ poll numbers. I’m glad we no longer have to question the motives of leaders when they do photo ops like this. They should have said the terror threat is about as credible as the governor riding the subway in a non photo-op situation. I certainly question the motives of Prime Minister Haider al-Abadi. Cuomo, Bratton, and Prendergast were reacting to downplay the threats. Cuomo looks silly, but I think the governor making a statement to show he trusts the safety of the system is a good thing. And? They probably were. Also: flight suits! Obama uses carefully crafted photo-ops of himself sitting pensively in situation rooms watching SEALs half a world away shoot ter’rists and pirates. I mean, hellloooooo. Everybody knows it. Besides, aren’t like half the posters here doing exactly what you claim nobody is doing? So much for the delusion of yours that people here just want to pick on Christie and Republikans. You are literally the only openly partisan hack here. Come off it. They each took a 5 minute ride to show us its safe, lol. 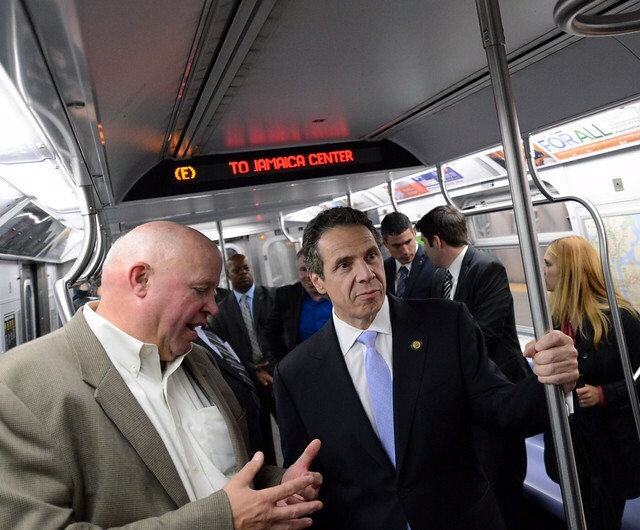 Does Cuomo actually know how to get home by public transit? Better photo op would be Cuomo at the turnstiles with a Metrocard, trying to figure out how to get in! Is there anyone else in that car who is NOT staff or security for those two? On the news telecast, there a few other riders on the train, that came up to the politicians, and shook hands, etc. The biggest threat to me as a newyorker is America. Because of feckless and imperious American foreign policy, people whose relatives have been killed by US bombs want revenge. Instead of going to the south or midwesst, where people will support any war, they come to big cities like nyc. Thanks a lot america for making me more unsafe and creating enemies of people I do not want to harm and dragging my city into a war cycle. How would you explain the attack on the rail line in Spain? Means, motive, and opportunity. You probably understand the first and last, but the motive is Europe is significantly more hostile to its Muslim population than the USA is, and it’s a powder keg across the continent. By comparison at least, they’re actually rather well-integrated here. In Europe, they are largely outcasts. Think how America sees Mexicans/Latinos, but add in cultural/religious resentment and full-on nationalism that would make the worst elements in the Tea Party blush. And the Muslim emigres to Europe are often the low-education, reactionary castoffs of whatever country they originated in (often Turkey in Germany, Algeria in France, Morocco in Spain). Many have low social standing and high levels of social frustration. Spain participated in the war in Iraq, and if CNN is to be trusted, 1,400 troops were stationed there at the time of the attack. The attack also took place a couple days before the election, and the anti-war socialist road into power on that platform, with PM Zapatero removing troops from Iraq shortly after. “in close communication with officials in Washington” — well, then, not to worry. that’s where the experts are, who know that the muslim brotherhood is secular and that islamic state is not islamic. The only credible threat detected is to Cuomo’s downstate support. But since he bitterly resents having to pay us any attention, all we’re getting here is a couple of photo ops of him standing…somewhere…in the subway system. Cuomo is a loser for NYS MSA. Hizzoner Ed Koch had his number pegged right from the start. Was NYS MSA a typo for NYC MSA? Because frankly Cuomo is a loser for the whole of NYS including upstate & the suburbs, but I don’t think there’s an NYS MSA. There is really no way to make the subway system more “secure” than, say, the streets or the parks. Some levels of danger you just have to accept. It is a funny composition. Prendergast is surfing the car hands-free. Cuomo has a white-knuckled death grip on the pole. He’s obviously never had to ride on anything while standing up before. And heaven forbid any of the entourage of suits should take an un-disenfected seat in an empty car, lest they be soiled with the detritus of the working class.